According to Vice Chairman of the Hanoi People’s Committee Nguyen Doan Toan, Japan’s foreign direct investment (FDI) in the city exceeds 10 billion USD, accounting for 25.5 percent of its total FDI value. Japanese-funded projects, like Nhat Tan-Noi Bai road, Nhat Tan Bridge, and the building of a smart-city area, have played an important role in the capital’s growth. Meanwhile, as Hanoi’s third biggest tourism partner, Japan had 303,000 tourists visiting the city last year. Hironobu Kitagawa, a representative from the Japan External Trade Organisation (JETRO), informed the conference that the fund channelled into the Hanoi smart city project was the biggest among the top-ten works invested in by Japan in Vietnam last year. He said that the estimated proportion of Japanese firms making profits in Vietnam reached 65.3 percent in 2018, praising the strengths of the local business climate such as high growth, stable political-social conditions, and low labour costs. A number of the Hanoi market’s shortcomings were also mentioned at the conference, including the incomplete legal system, complex tax-related procedures, and difficulties in purchasing domestic materials and spare parts. Toan stated that the capital city is committed to stepping up administrative reform with people and enterprises as the center. Local authorities are willing to listen to feedback and proposals from the business communities in Vietnam and abroad to better the investment environment, he added. 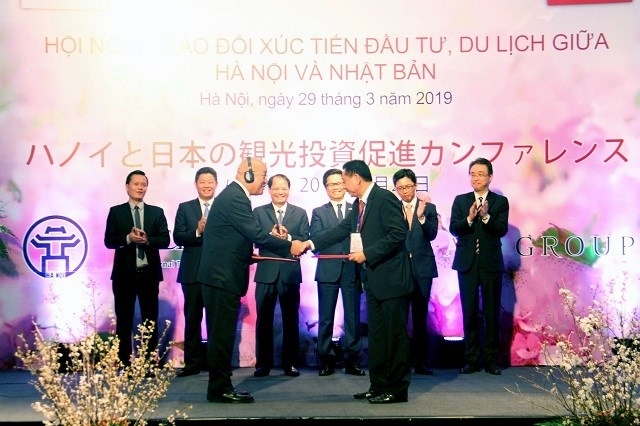 As part of the conference, a discussion with Japanese firms operating in Hanoi and a signing ceremony of memoranda of understanding on trade, investment, and tourism cooperation were held between the city’s public agencies and enterprises alongside their Japanese peers.